Jean-Louis-Ernest Meissonier had one of the more remarkable artistic careers in nineteenth century France. Although largely self-taught, he became the highest paid painter in the second half of the century, an accomplishment that stems from persistence, congeniality, and the capacity to understand both the strengths and limitations of his work. Meissonier was born in Lyon on 21 February 1815, just as the Napoleonic era was coming to a close. His father, a dye merchant, moved the family to Paris three years later. By the early 1830s, Meissonier’s natural inclination for art led him to study very briefly with Jules Potier, and then with Léon Cogniet for a period of five months. His primary teachers, however, were the seventeenth and eighteenth century Dutch, Flemish and French painters at the Louvre, particularly the still life and genre painters. It comes as no surprise, then, that Meissonier’s first submission to the Salon, in 1834, was a small painting called Flemish Burghers which was essentially a costume piece featuring three sober-looking gentlemen clad in traditional seventeenth century clothing. The play of light and shadow, as well as the delicately rendered tabletop still life, echoed the works of painters such as Gerard Dou or Gabriel Metsu, whose paintings were attracting increasing attention from a new generation of still life artists. In addition, Flemish Burghers appealed to the bourgeois taste for historical costume dramas. The critical and popular acclaim was overwhelming; the Société des Amis des Arts purchased the work for 100 francs, and Meissonier’s career was launched before he reached the age of 20. Despite this early success, Meisonnier’s painting did not bring immediate financial security. Rather, his primary source of reliable income in these years was the design of wood engravings for book illustrations. Today, books such as Léon Curmer’s edition of J-H. Bernardin de Saint-Pierre’s Paul et Virginie (Paris 1838) are sought after precisely because of those illustrations. Meissonier’s persistence in submitting work to the annual Salon also proved to be a smart choice. With the triumph of Flemish Burghers in 1834, the young artist realized that his skill in creating evocative—and precisely detailed—historical genre images had the potential to become a solid base for his career. Pursuing that strategy, he exhibited Chess Players: Flemish Subject and The Little Messenger at the Salon of 1836; A Reader in 1840; and another Chess Player in 1841, for which he won a second-class medal. The defining year, however, was 1842 when he exhibited Smoker and The Bass Player, which attracted glowing commentary from the art critic and poet, Théophile Gautier. “In their small scale, we place these inestimable works without hesitation beside those of Metsu, Gerald Dou, and Mieris; perhaps even above them, because Meissonier has the truth of drawing, the fineness of tone and preciousness of touch joined with a quality that the Dutch hardly possess—style.” [i] With such acclaim, Meissonier became the most sought-after painter of the decade, appealing to a wide range of collectors. His prices rose concomitantly, and by 1847, he was able to purchase an elegant suburban home in Poissy—a noteworthy accomplishment for a self-taught, 32-year-old artist who had neither social connections nor high-placed supporters when he began. Both social and cultural customs changed radically in 1848 when revolution swept through Europe. In Paris, the “citizen king”, Louis-Philippe was forced to abdicate in February, leaving the country awash in civil strife. As a captain in the National Guard, Meissonier led the troops responsible for defending the Hôtel de Ville; and there he witnessed the carnage first hand. In part, his response was to paint one of his most significant images: Memory of the Civil War (The Barricades), an unflinching depiction of the incomprehensible horror of civil war. Piles of bodies lie in the claustrophobic street in varying stages of decomposition –untended and unclaimed. Blue shirts and white shirts, all stained with blood, create a grim “tricolore” far removed from patriotic flag-waving. The painting was exhibited at the “Realist Salon” of 1850-51 where it received considerable attention, as much for the change it represented in the artist’s work as for the somber subject. Although relative peace returned to France as the Second Republic evolved into the Second Empire under Napoleon III, Meissonier remained focused on military subjects. Throughout the 1850s, he combined genre techniques with military themes such as ordinary soldiers going about daily routines, which found an eager market among the numerous French veterans. However, when critics at the Salon of 1857 complained that his work was repetitive, Meissonier began expanding his repertoire to include large history paintings. Clearly, this was a calculated risk: he had already received the Grand Medal of Honor at the Exposition Universelle in 1855, as well as imperial attention when Napoleon III purchased The Quarrel at the behest of Queen Victoria—who then presented it to Prince Albert. In addition, his private clientele was extensive and growing. Branching out into history painting—without the formal training that typically required—was to court an uncertain future. Indeed, Meissonier’s initial foray into history painting, in his 1863 painting of Napoleon III at the Battle of Solférino was not well received. Perseverance again served him well however, as he redirected his attention to the romanticized military campaigns of Napoleon I, and received a warm reception at the 1864 Salon for 1814, The Campaign of France. The meticulous detailing of his earlier genre paintings was now magnified many times over in the large format, offering viewers a sense of immediacy in the image, but also requiring long hours of historical research and painstaking painting. By the time of the 1867 Exposition Universelle, where he showed fourteen works, Meissonier had established his reputation as a history painter as well as a genre painter. The prices he commanded were astonishing: The American collector, A. T. Stewart purchased Friedland, 1807 for an unprecedented 380,000 francs ($60,000) in 1875. [ii] Beginning in the 1870s, Meissonier was represented by the Georges Petit Gallery, who not only promoted his work among wealthy Americans such as William T. Walters of Baltimore and William Vanderbilt of New York, but also showcased his painting with frequent exhibitions. Of particular note was the May 1884 retrospective exhibition celebrating the 50th anniversary of Meissonier’s Salon debut in 1834; 146 examples of painting, sculpture and engraving were displayed. In 1889 Meissonier accepted the position of president of the Exposition Universelle, France’s extravaganza celebration of the centennial of the Revolution—for which the Eiffel Tower was designed. For Meissonier at age 74, it undoubtedly brought recollections of his own journey through the politically and artistically turbulent decades. 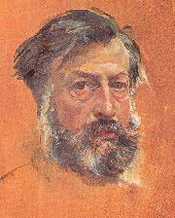 He exhibited nineteen paintings at the Expo and became the first artist to be awarded the Grand Cross of the Legion of Honor. Unflagging in his commitment to the arts, he also helped to establish the independent Société Nationale des Beaux-Arts the following year, and became its first president for a brief period. Meissonier died in Paris on 31 January 1891 just 21 days before his 76th birthday. Two years later, in 1893, the Georges Petit Gallery held a posthumous retrospective of his works. [i] Edmond Bonnaffé, “Un dossier de documents inédits pour servir à la biographie de Meissonier” Gazette des Beaux-Arts (August 1891), 128. [ii] Eric Zafran, Cavaliers and Cardinals, Nineteenth-Century French Anecdotal Paintings, (Cincinnati: Taft Museum, 1992), 9.